The natural color near the farm is getting a bit slim. I took the dogs for a walk on Friday and took my camera along looking for bits of color. In just a couple days, so many of the leaves had come off the trees and everything was looking quite gray and neutral. This pretty red apple was hanging on. On days like these, I am happy that I have filled my home up with lots of color - both bright and happy and more muted and earthy. Color makes me feel good and I think it is one way to get through the dark months in the northern hemisphere when there isn't much color left outdoors. 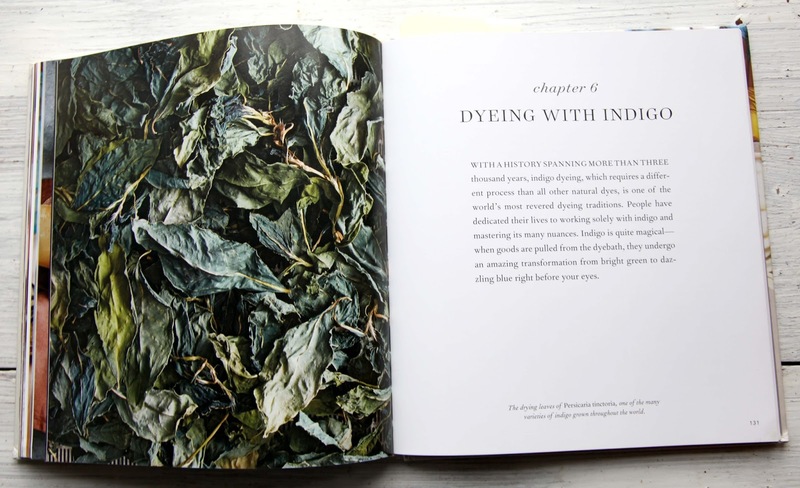 There is a beautiful new book on color and natural dyeing available now from STC Craft. 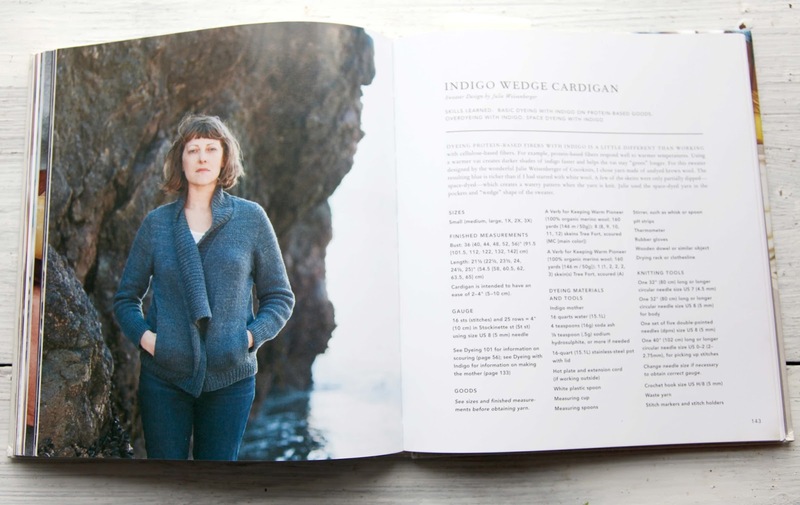 Edited by Melanie Falick (who happens to have a new blog), The Modern Natural Dyer is written by Kristine Vejar, owner of A Verb For Keeping Warm, a yarn store and dye studio in Berkeley, California. I have done a bit of natural dyeing in my lifetime and it was great fun. There's something about taking stuff you find in nature and coloring yarn to knit with or fabric to sew with. 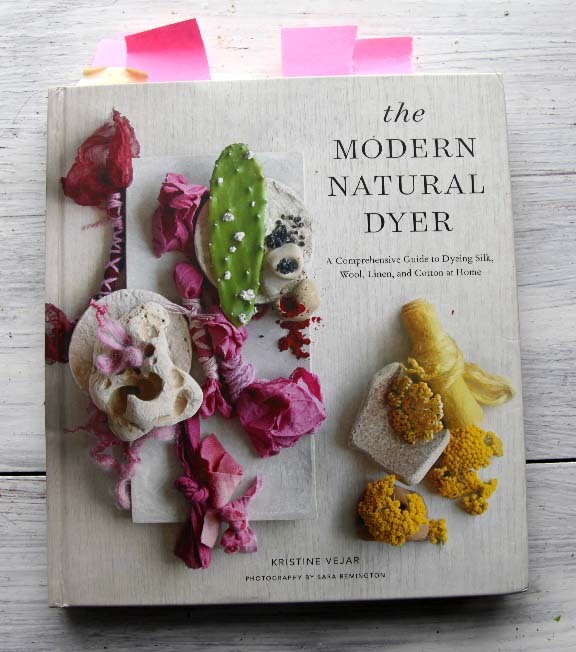 The Modern Natural Dyer is beautifully designed and photographed by Sara Remington. This book is so well done. 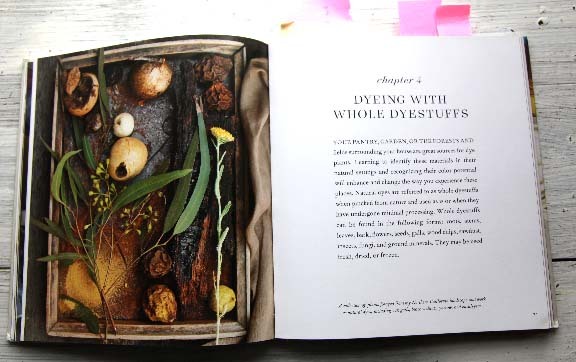 Although there are other books out there on natural dyeing, I do not think there is one as beautiful as this one. And it is not all fluff. There are 25 pages of hard-core instruction. And good instruction it is. With many things that I did not know and new techniques (to me). Kristine gives instruction for dyeing with both whole natural bits and powdered extracts (like cochineal and logwood). There are also instructions for dyeing with indigo. I seriously need to give this a go next summer. The Modern Natural Dyer gives 2 fantastic color charts with recipes to make the colors shown on both protein and cellulose fibers. Not only is there fantastic instructions but there are also many, many projects. 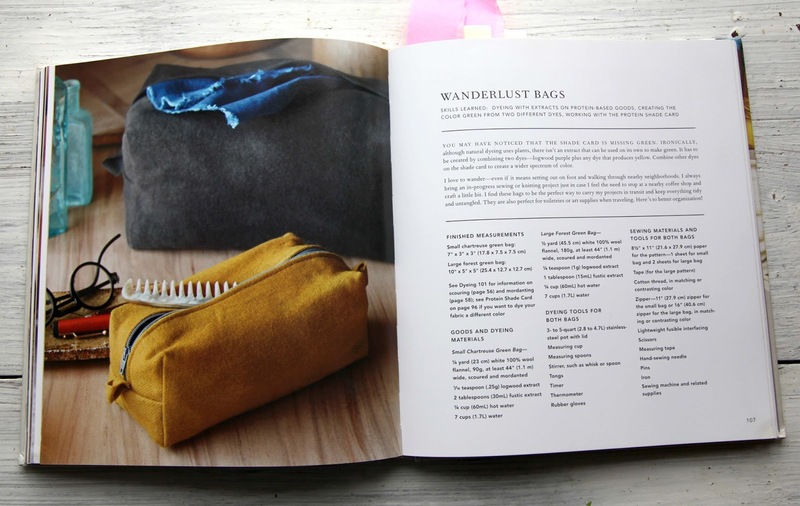 Both sewing with natural dyeing fabric and knitting with natural dyed yarn are included. Here are a few of my favorite designs from The Modern Natural Dyer. I think my favorite project from this book is the "Flowers At My Fingertips Sewing Kit". I can imagine doing this with my friends - collecting the flowers, "printing" with the flowers and then sewing the kit. Really nice. And there are great instructions and photos on clamping and dyeing fabric with indigo. The Modern Natural Dyer is available for $29.95 and it is hardcover and 192 pages. It would make a splendid holiday gift for someone who is interested in yarn, fabric, and color. 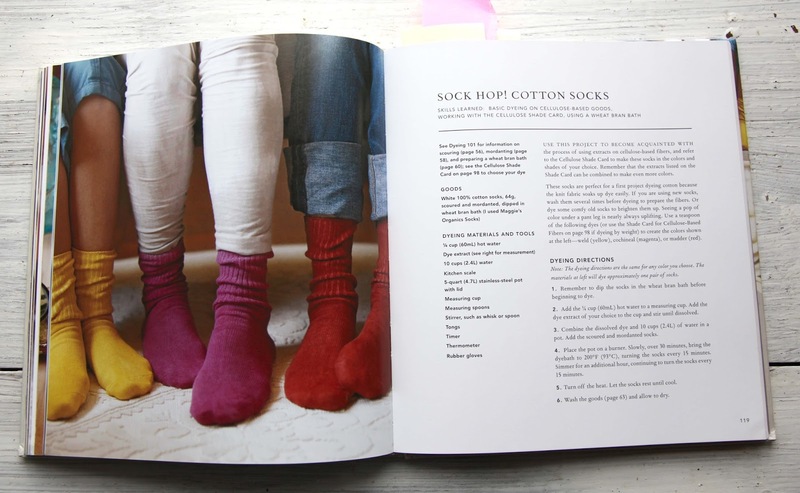 Tell me about your experience for dyeing or knitting with natural dyes. If you don't have any experience, just share something you want with all of us about nature, color, yarn or fabric. Good luck everyone. Contest ends Wednesday November 11th at 11:59 p.m. Please, as always, leave an easy way to get a hold of you - Rav id, blogger id, or email. Thanks to STC for supplying my review copy and the winner's book. Good luck everyone! I'm very interested in experimenting with natural dyes. I'm a spinner and knitting and hope to start dyeing fiber. Mother Nature is the ultimate artist! Shy of the old laundry "mishap", I've never attempted dying yet. Although my Mother has is the past. That book looks "helpful"! Anyhoo, I managed to survive my first Christmas Fair of the "Season" yesterday. Totally *pooped* today though! - However, one of the most common observations of my "work" by the SHOPPERS, were about the "COLOURS"! And, combinations thereof... I thought of You whenever anyone said it! And, wished that You were THERE to "share"! I am surrounded by nature and would love to learn how to dye with natural colors. I have been using natural dyes for over 39 years. I grow most of what I use. I dye a lot of fleece from my spinner's flock and then have it carded into roving to spin myself or sell to other spinners. It is a labor of love. I just finished dyeing with black walnut and onion skins. They will be blended into roving, the color of brilliant fall leaves. I so enjoy your blog and patterns. I've only dyed with indigo (Synthetic) but it's a fascinating process. I would love to do more dyeing with natural dyes. Love the subtle colors you can get with natural dyes. Oh, wow, a book to die (dye) for. I have always wished to try this and I live in the country where there is much to choose from. Beautiful photos. I've always wanted to try natural dyes but never got around to it. I have used other dyes in a crockpot which was fun. Many years ago I tie dyed clothing and household linens to give the old hand me downs a fresher look. Plain old Rit dye though. This looks like a gorgeous book. I would love to learn to use natural dyes. It seems like a logical progression of my love for natural fiber. 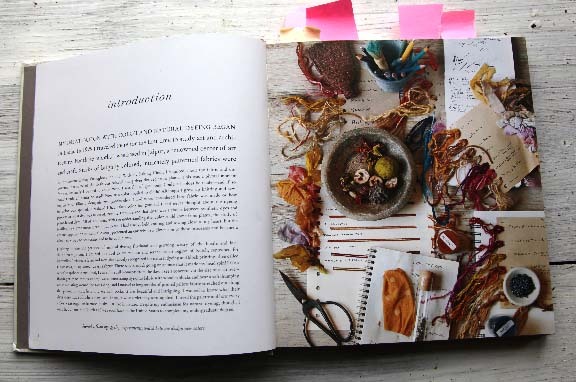 I very much want to try dyeing yarn--I have even purchased Gail Callahan's book. However, I haven't taken the next step! I have tried black walnuts, onion skins, logwood and cochineal with varied success. The books looks fabulous! The only dyes I've used were Easter egg dyes on some alpaca fiber. I had hoped they would come out deeper colors but realized they were pastels. Then when I carded the colors together, they all got very muted. 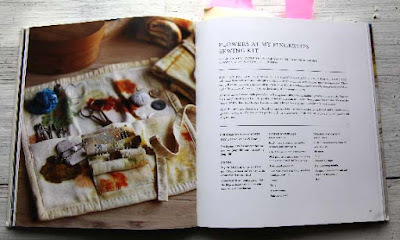 I would like to try dyeing again with natural things so this book really interests. me. I have played with Kool-Aide dyeing with my daughter & her friend years ago...all the yarn had that familiar beverage smell... & it was a fun craft project. Tea & coffee dyeing "aged" my fabric.... I have been fortunate to live near Gail Callahan, the Kangaroo Dyer, to have been in her dyeing space and to have attended community presentations on the how-to. I would love to add this book to my library...thank you Kristin for the opportunity! As I grow older, I seem to notice color more and more. 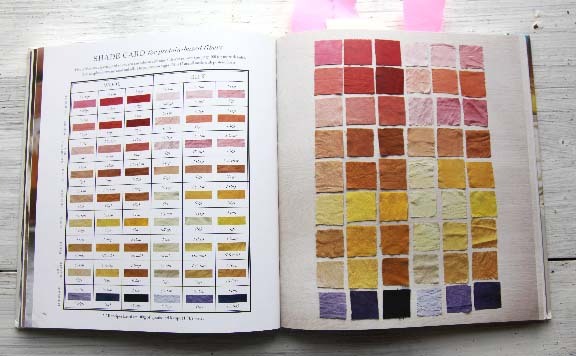 Knowing how color is achieved in fiber is fascinating and this book looks like it will shed a lot of light (color) on the subject. Love the calmer colors most natural dyes produce - vibrant but not searing. P.S. We are loving our wonderful cats from your farm still after two years. They were more than worth the snowy drive. I particularly love dyeing with indigo. I read everything I can find about indigo. This book looks like a must-have and I know several people who may be getting this for Christmas. I have knitted and quilted most of my adult life, which involves a good number of years now, LOL. I have gone thru many phases, including one where I got quite involved and knowledgeable about natural dying. My favorite technique was to grow my own woad and put it thru the process of turning it into a usable form of indigo. Woad is easy to grow and produces a big bang for your buck when actually dying with it. I can still remember picking, and processing it, the entire time not knowing if what you are doing is actually working correctly. Finally you dip that yarn in and pull it back out the ugliest color you can imagine. You only have about half a second to think about how you must have done something wrong and ruined your yarn, before it turns to the most beautiful blue you can imagine. Almost orgasmic for a true fiber loving human. I once knit a pair of socks out of some of that blue, that for some reason turned my feet blue every time I wore them for about 2 years. But no problem, the color and chemical compound of indigo(same for woad)is supposed to be very healthy and lucky so I wore those blue feet with pride. I've dreamed of dyeing delicious white wool in the backyard with our four grand-daughters...permitting each to dye some wool that I will make into warm winter mittens! But alas I've let several years go by without taking the plunge. Perhaps I just need to read up and gain courage? Currently I am making baskets out of cotton rope. My next step is to dye some of the rope. 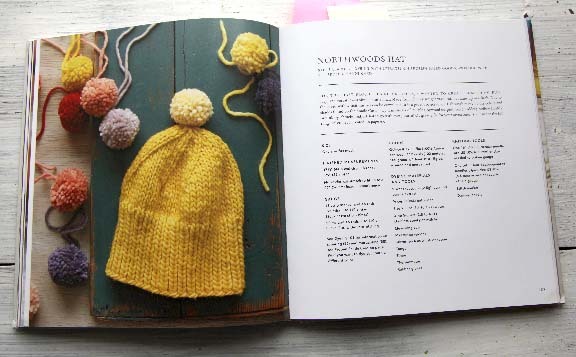 Between quilting, knitting and bowl making, I could stay busy with this book. I dyed silk in an indigo pot in September with Seven Sisters Arts. I stitched a pattern for the resist. It was fun, but I still want to dive deeper into the vat. That color chart is fantastic, and really gives a great example of where natural dyes will take your work. I've dyed mostly fabrics with natural dyes...tea, coffee, rust, and beets. Some more successful than others. I would love to have a resource to make my dyeing attempts more permanent. Great giveaway! I haven't tried natural dyeing yet - but have been collecting books and information on the topic. I'm especially interested in applying natural colors in my favorite colors (purple, blue and red) to yarn and fiber, and seeing what I can grow in my garden/yard to create those dyes. Thanks for the opportunity to win this book! I've been interested in this book from the first day I heard about it. I'm always amazed how nature has all the things we need if we but look, learn, and use them. 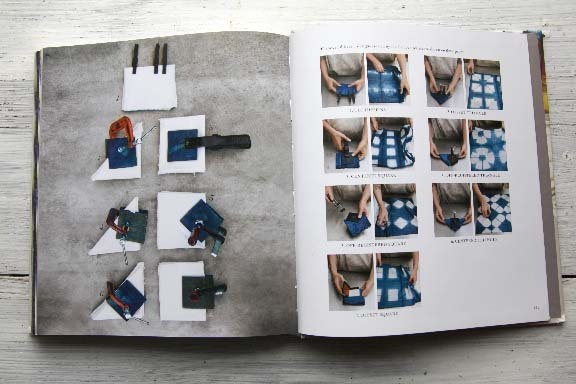 Kristine's book seems like the perfect match of seeing, learning and then doing. I once heard someone say that with the colors of nature all go together; they don't clash with one another. I've dyed with food coloring, koolaid, cake dye and acid dyes. But my heart yearns for natural fiber and natural dyeing. I just need to learn how. Thank you for this opportunity. I haven't done any dyeing with natural but have always wanted to try. I have played around with kool-aid on sock yarn which is so fun. I have been using the plants and flowers that grow around our farm for years now as natural dye! I just love the subtle colors and how they all compliment one another! I would LOVE to have this new book! I've never (yet) used natural items to dye my fabrics. Would love to give it a try. Wow, that you would cover this craft. I have wanted to do natural dyeing but have not had a reliable instruction to do it. I tried with raspberries just because I had them available and it was such a pretty color, but it did not stay in the wool. Obviously I was missing something... I need this book! We have thought of raising a few sheep since we only have about 3 acres, but as of yet have not put the idea into play. we stay busy with our 7 Geese, 8 ducks, 12 chickens, 3 rabbits, 2 kittys and 3 dogs. Love them all! There are some Alpacas up the road I can get some wool from and I purchased a drop spindle and a Craftsy class on spinning so I am good to go. Just need this book! Also, I have not learned to knit. I have tried, but not caught on yet. I plan to learn as I want to make socks. This would be fun, natural dyed woolen socks, I love it. 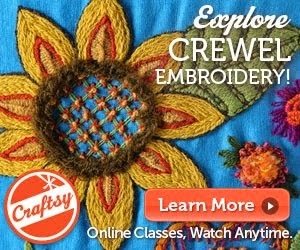 I have learned Crewel embroidery and I love it. I made this pillow and also a few other projects from your book Colorful Stitchery. Dyeing wool for that would be fun, as it has been a challenge to find my own wool locally. I would love to win this book. *:) happy Thank you for considering me, Kristin. I, too would love to "experiment" with some dying of yarn and see what I could produce. I love the thought of it and the yarn and fabric that I've seen produced on blogs and Instagram over the last couple of months have been gorgeous and tempting!!!! This book seems to have captured a lot of attention. Thankyou Kristen! I just did some natural dyeing with walnuts and I may be hooked! Now that I've found my local walnut tree, I suspect that I'm going to be doing a lot of experimenting with that. I've only used dye once and that was to redye some black clothes that had faded to gray. It worked okay, but was quite the messy project. I have a friend who owns an alpaca farm, and she dyes fiber using natural resources. The results have been amazing. It's enough to encourage me to try it! Hi Kristin - This looks like a wonderful book. 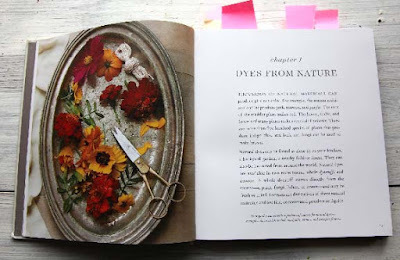 I'm interested in natural dyeing and since I haven't had much luck with organic vegetables (they get eaten by bugs - at least the bugs are staying healthy!) I thought I might just give up the space to butterfly weed and a dye garden. I can use all the help I can get. Thanks for the opportunity! karenswb on Rav. In 2012 I attended a natural dyeing retreat in New Mexico, led by two local fiberistas. It was a fascinating 4-day session where we, a group of about 18, turned our alpaca/woolen skeins (light gray) into colorful yarn that we chose from natural pigments and mordants. Cooking and stirring them in pots while we learned about local and global plant (and insect!) sources for dyes was unforgettable. I have always wanted to dye some yarn out of red and yellow beet water. They are such beautiful colors. this book looks like a lot of fun. Ravid: NaomiKnitster. In the '70's I did a lot of natural dyeing. I'm sure there are lots of new things to learn. Indigo is the one nature dye I've yet to try. Now that I have a back yard of my own where I could leave something smelly for a week or so I may try it. It is totally NOT natural but I once dyed a bunch of yarn using old copper pennies. It was a pretty aqua color. I am just entering the world of natural dyes! I took a dying workshop with Kathrin Weber (Blazing Shuttles) using commercial dyes - what a trip! And my guild hosted a mushroom dying workshop a few years ago before I was involved. The world is wide open for color! I am a novice weaver and just starting to really jump in! Wow! It just happens that this past month or two I started collecting black walnuts. In the process of cleaning them, I was so tempted by the dark brown water that resulted from scrubbing hull remains from the nuts that I couldn't resist putting some white knitted items in the bucket: a long Ribwarmer, a cabled hat, a pair of socks and the Maltese Fisherman's hat. And the results are fabulous! All the garments are a nice soft shade of brown. Next year I'm going "whole hog" and will use the whole hulls! I have never dyed yarn but I have done reed. A friend of mine and I went 'hunting' for 'ingredients' to use ... i.e. lichen, burdock root. T'was fun to experiment. The reed made for beautiful and interesting baskets. I have minimal experience with dyeing - a market session at Stitches East with Kool-Aid, but it was so fun. 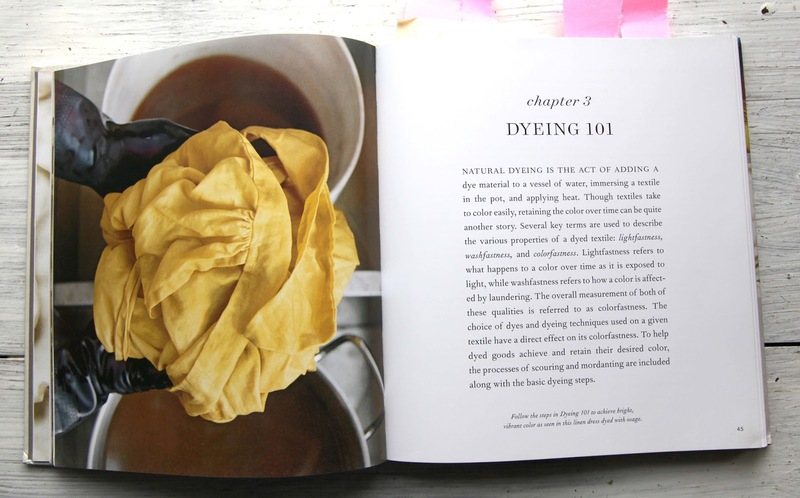 I would love to try natural dyeing and this book looks like a great resource. I haven't done any dyeing although I love beautiful "handcrafted" yarns. My latest project is knitting fingerless mitts for my Grandaughter to use in marching band. I had never attempted the actual partial fingers until I made this pair. The beautiful Texas Fall weather we are enjoying gets me in the mode to knit up a storm. I've experimented using turmeric, hibiscus, and black beans for dyeing. Turmeric has worked the best. It makes such a lovely shade of yellow. I did a little natural dyeing back in the 1990s, taking a class at the university craft center. I remember using logwood, cochineal and indigo and loving the soft, semi-solid shades of yarn I got. I'd love to do more, tho I don't really have a good place to do it in my current apartment. I really need to win the lottery so I can have a place with a studio to dye in. I have been natural dyeing as long as I have been spinning, over 30 years now. Two of the easiest and my favorites are Black Walnuts and Goldenrod. Both readily available in my area. In my earlier years I dabbled with mushrooms and grew most of my own dye plants. Wold, weld, and others grew well in my garden. I do love experimenting with plants and bark, and have taken a few workshops in Lichen dyeing. I hope to have a natural dye party at my house next summer. You never know what dyes everyone will bring. Fun for all. I have little experience beyond dyeing with food color, which I found fun. But when I was in college, we did a really neat lab with a special piece of fabric that had strips of all different kinds of fibers, so we could see what kinds of dyes would work on what kinds of fiber. I've never dyed yarn but would love to try, and using natural products is very appealing. Thanks for the great give-away! How timely! I am taking a spinning class this weekend at Webs and have been researching natural dyeing. I grew some Tansy in my garden this summer with this in mind. I would sure love this book! Thanks Kristen! I love the color charts and collage style of the photos, it looks outstanding. Years ago, when I taught knitting in After School Programs, I dyed all the children's cotton handwork bags, with kool aid colors, also adding turmeric for more yellow. I would like to learn far more about natural dyeing with fabric & yarn, especially with indigo & all kinds of wildflowers & herbs. I'm inspired to grow more of these plants near my Fairy House Garden next year, after reading your book review. When I was young, there were so many more wildflowers that we played with. Also, we used the dried milkweed pods to make birds from, painting them with watercolors. Did anyone else ever do that? I'd love to have a wet felting class for children using plant dyed wool, that would be fun! I found several balls of plant dyed homespun at the Conner Prairie History Center (Indianapolis, IN) and hoarded it for years. The colors were so rich, deep and -- well, natural. Eventually I knit a "potato chip" scarf, separating the colors with a unifying Koigu and gave it to a relative. The colors were fabulous and I would like to recreate them! I love the subtle beautiful colours of natural dyes, plus the idea of no chemicals. I have tried making natural dyes with wild marjoram/origano and blackberries etc adding vinegar or salt as a fixing agent I thought, with poor results. Wanting a Violet colour of any shade I ended up with muddy yellow. 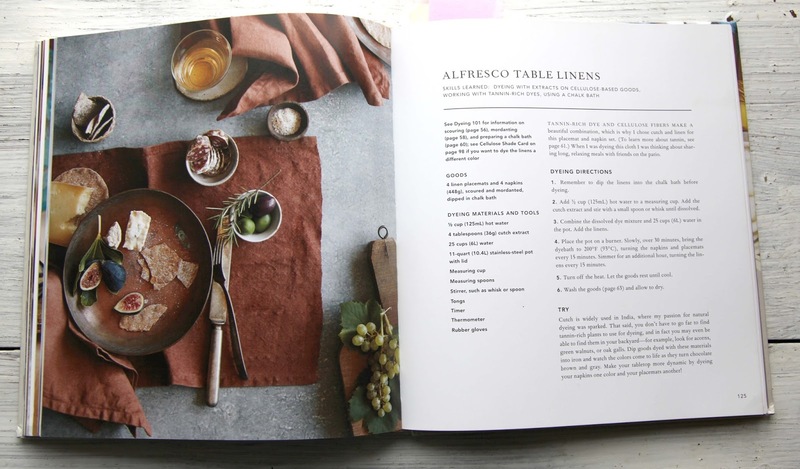 So I would love to learn more from this beautiful book on how to obtain beautiful shades of grey, purple and pinks reminiscent of chalky French shades of linen etc. My experience with natural dyeing turned into an exercise in felting. Need I say more? I need this book. I have gotten a lovely lemon yellow on my handspun from rhubarb leaves that I got from the Amherst farmer's market. Using rhubarb doesn't require a mordant. I have used one of those pre-reduced indigo kits. It was really quite easy, if a bit messy, and the blues that it created were just amazing. Indigo blue touches my soul. I would love to learn more about indigo dyeing, and how to set up a proper vat. Even to grow some indigo or woad plants would be so fun. I have purchased some naturally dyed yarn as well, and find the colors appealing and earthy. Thanks for the chance - fingers crossed! I have not dyed yarn, but do want to learn. I love fall colors. So glad I live in beautiful West Michigan where the colors are glorious! 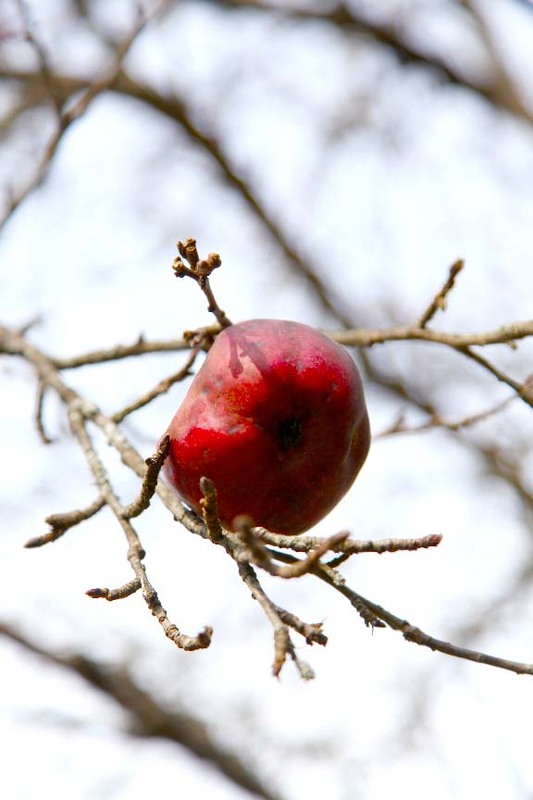 DON'T MISS A POST FROM THE FARM. GET E-MAIL NOTIFICATIONS TO ALERT YOU OF A NEW POST! Our Leyden Glen Farm Featured on Houzz's World of Design: 9 Farms from Around the World. Visit Kristin's profile on Pinterest. The Lamb Races - It's Silly! 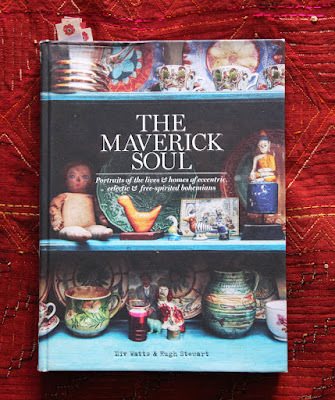 I am an author and artist specializing in surface design including the disciplines of ceramics, textiles, needlework, knitwear, stitchery, and interior design. The thread that holds my work together is color and pattern. I live in western Massachusetts, USA in a 1751 farmhouse with my husband Mark and daughter Julia on a farm along with over 250 sheep, chickens, cats and dogs. All words and photos are copyright by Kristin Nicholas. Please do not use my original photos or reprint my writing without asking me for permission. Please make sure you credit me as Photographer and link back to this blog. If you have any questions, don't hesitate to e-mail me - my contact info is on the left sidebar. Thank you!